‘Canals and railways often keep close company through cities. They run alongside each other, separated by only scrubland and secure fencing. Same route, different speeds. This proximity is very convenient when getting to Canal Poetry events. As I wheeled my suitcase north along the towpath from the station in Oxford, the train I’d just descended from blasted its horn as it sped away, disappearing in a blur towards Birmingham. I’d just returned to Oxford after a week at Totleigh Barton, the Arvon Foundation centre in Devon, where writers have no internet access and, consequently, lots of time for conversation and creativity. I wondered if my return to the real world would be challenging. A walk along the canals seemed to be a good way to ease myself back in. I trundled my case over the small, steep bridge at Louse Lock and passed the Jericho Boatyard – immortalised in Philip Pullman’s YA novels – currently boarded up pending development. I dawdled a little to enjoy the narrowboat roof gardens, at their late summer best. But I didn’t have all day: soon the Oxford Canal Festival would be kicking off in Aristotle Park. On reaching the park I found the Dog Show underway (categories included ‘Best Biscuit Catcher’ and ‘Best Trick’) in an arena marked out with straw-bales, which would later host the Canal Olympics for humans. 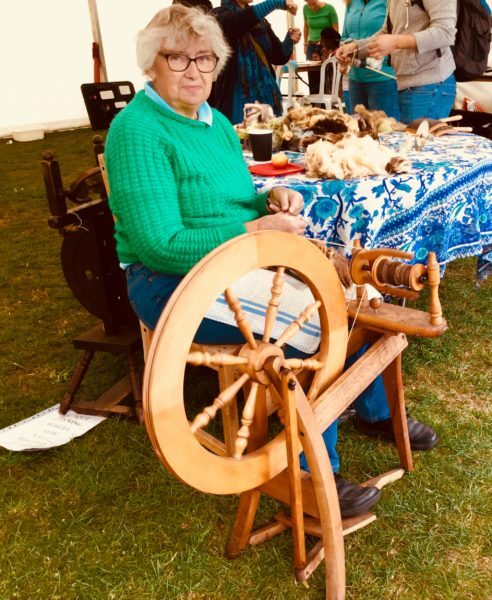 Powered by gigantic slab of Chocolate Guinness cake from the Restore fundraising café, I spurned these sports and instead took up my position in the Arts & Crafts tent where the Oxford Canal Ever-Growing Poem had already begun. Few people arrived here intending to write poetry. 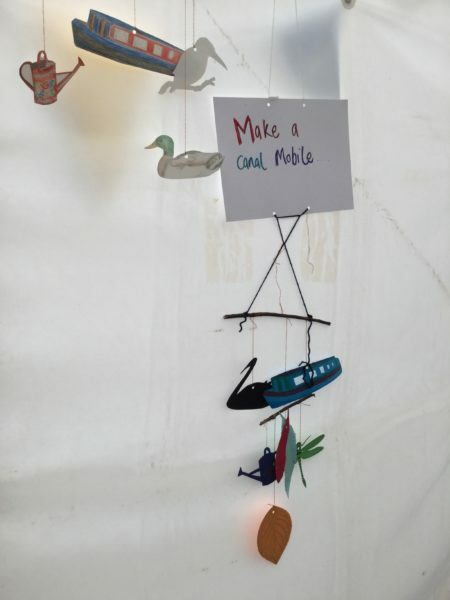 They came for the promise of painting roses and castles on paper plates, trying their hand at spinning yarn, making waterway-themed mobiles or designing their own narrowboat. However, some could be persuaded, especially as the day went on and the cider flowed in the neighbouring marquee. I invited rhyming couplets, which came with varying levels of attention to metre, and indeed rhyme. But this was a joyous occasion, and not one for strict poetry rules. The lines accrue on a long roll of brown parchment hung from the marquee joists, so people can see what has come before. Perhaps inspired by the antics in the arena outside, the composition process seemed oddly motivated by competition. People wandered over and read the most recently completed lines, and were keen to show they could do much better. Yet the best lines were often those most swiftly and spontaneously given. Eventually the afternoon drew in and a rainstorm whipped up outside, driving festival-goers on to other entertainments. I rolled up the poem and squeezed the epic paper roll into my case, before hitting the towpath again. here’s some of the things you’ll see. beside the towpath, mile upon mile. daisies, tomatoes and the odd gourd. to take you north to Wolvercote. it’s a world away from the shopping malls. but steering it with ease and skill. or lose your hat in a sudden breeze. you can walk or cycle it just as well. it keeps you fit and makes you laugh. for the swings in Aristotle Park. A philosopher’s park? – you bet! (she loved the water too, you see). or just to escape your workstation. dogs with sausages, dogs doing tricks. where the anglers sit with their fishing nets. but the ducks couldn’t care less. kingfishers, herons, moorhens and coots. they feel life’s pace begin to slow. 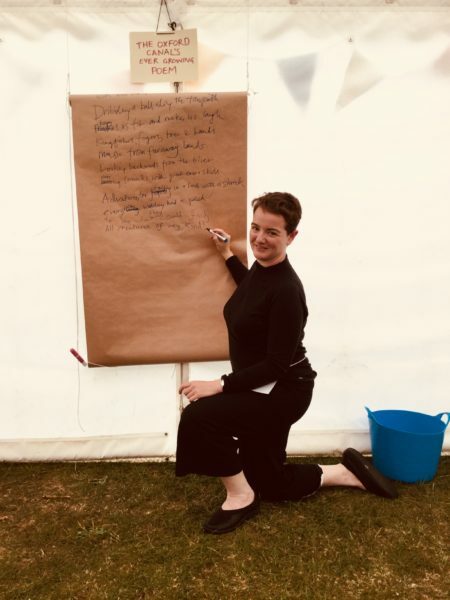 Follow Nancy Campbell’s adventures as she reports on her poems and projects during her time as Canal Laureate. Scroll back for posts from previous Canal Laureates Luke Kennard and Jo Bell.